The Franco-German peace initiative could be the last ditch attempt to end the war in Ukraine, French President Francois Hollande said. German Chancellor Angela Merkel believes the crisis cannot be solved militarily. Hollande described the peace talks he and Merkel held with the presidents of Russia and Ukraine this week as “one of the last chances” for peace. "If we don't find not just a compromise but a lasting peace agreement, we know perfectly well what the scenario will be. 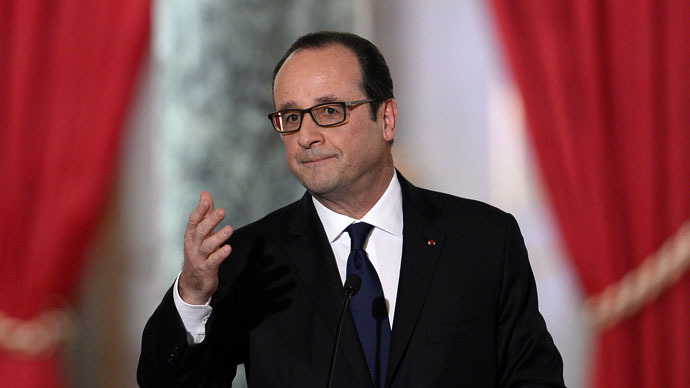 It has a name, it's called war," Hollande told journalists in the city of Tulle in central France, according to Reuters. Earlier on Saturday, Angela Merkel was sharing her vision of the possible solution to the Ukraine crisis at the Munich Security Conference. “The Ukrainian crisis cannot be resolved militarily,” she said. Merkel is sure the Franco-German initiative was worth undertaking even if so far its results are unclear. "After the talks yesterday in Moscow that the French president and I had, it is uncertain if it will succeed," she said, as cited by Reuters. "But it is my view and the French president's view [that it’s] definitely worth trying. We owe it to the people affected in Ukraine, at the very least." #Merkel "doubtful" of successful outcome from talks with Moscow on Friday. Merkel touched upon the much-speculated prospect of sending weapons to Ukraine. "I understand the debate [on weapons supplies] but I believe that more weapons will not lead to the progress Ukraine needs. I really doubt that," she said, according to Reuters. Voices in support of the move have been raised in Washington. President Barack Obama's nominee for Defense Secretary, Ashton Carter, said on Wednesday he favored weapons supplies to Ukraine. US Secretary of State John Kerry heard more pleas for weapons from the Ukrainian leadership on Thursday. He said President Obama would make his decision next week on the possibility of sending lethal aid to Ukraine. NATO's top military commander, US Air Force general Philip Breedlove, believes the West should not rule out arming Ukraine. "I don't think we should preclude out of hand the possibility of the military option," Breedlove said, adding there was "no conversation about boots on the ground." Europe has largely been against military assistance to Ukraine, believing it could further destabilize the region. In an interview during the Munich Security Conference, British Defence Secretary Michael Fallon told Reuters that he fully supported a new effort by the leaders of Germany and France to try and halt the Ukraine conflict, while saying that supplying Kiev with weapons would only escalate it. Political analysts believe the dispute inside the US on whether to arm Ukraine could in fact trigger the Franco-German peace initiative, with Europe being reluctant to have a full-blown war on its doorstep. “President Hollande, Chancellor Merkel seem to have a much greater sense of responsibility about the importance of getting a quick ceasefire and new negotiating framework or restore negotiating framework on the Minsk process in place. One does not sense the same urgency in Washington,” Martin Sieff, columnist for the Post-Examiner newspaper told RT.